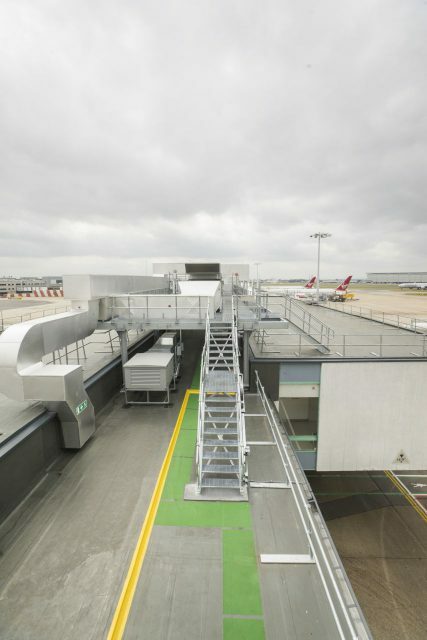 The refurbishment of Pier 7 at Terminal 3 Heathrow began in December 2015 following ongoing problems of water ingress within many of the departure gaterooms. The existing terminal comprised of a connecting spine running the full length of the building (approximately ¼ of a mile long) with 9 departure gaterooms intermittently located along its length. The central spine roof housed a large amount of plant and equipment; some surface mounted, some within pre-fabricated plant rooms making access across the roof to maintain the equipment very difficult. The task of the project team was to completely remove and replace the existing roof mounted equipment and lift it over 2.5m onto a new steelwork mezzanine structure. Once removed, access to the existing flat roof areas would permit the removal and replacement of the existing bituminous waterproofing system. The proposed Icopal specification included the installation of Micoral SK Vapour Control Layer, tapered PIR insulation, Pyrobar Underlay (as the carrier layer) and the Elastoflex Solvent Free liquid applied waterproofing membrane. The project was extremely difficult to manage and required a collaborative approach, working alongside other contractors whilst also ensuring that any internal disruption to the building usage was kept to an absolute minimum. Furthermore, all of the existing waterproofing removed from the roof had to be collected into bins and bags to ensure nothing blew onto the adjacent run way areas. At the end of the project, the total number of man hours was recorded at just over 287,000! The sub-contracting team from Itech Roofworks completed the waterproofing works to an exceptional standard, within the given timescales and demonstrated that difficult and challenging projects should not compromise the finished quality of the roof membrane.